The base of the Ronald Reagan statue, situated within the National Capitol Rotunda within the U.S. Capitol building in Washington, D.C., has pieces of the Berlin Wall incorporated into the cornice of the base to memorialize Reagan’s role in the destruction of the wall. Drew Altman is president and chief executive officer of the Kaiser Family Foundation. He is on Twitter: @drewaltman. Health care has faded into the background of the election campaignas Donald Trump himself has become the issue on the Republican side and the debate between Hillary Clinton and Bernie Sanders over health care has shifted to other topics. Health wasn’t even listed among the “most important issues” Republican voters could select from in the exit poll of Tuesday’s Wisconsin primary. But that doesn’t mean health is a total non-factor in the primaries; it is a more salient issue for some voting groups than others. And a broad constellation of health issues, not only the Affordable Care Act, are likely to have traction in the general election, particularly among women. 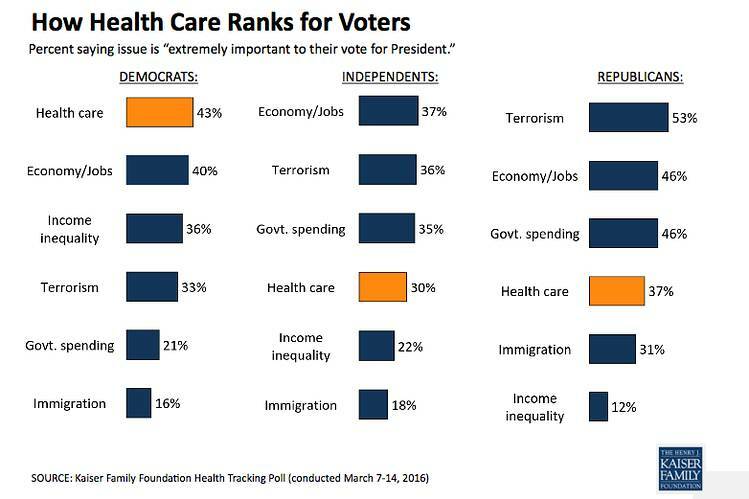 Health has traditionally been more of a priority for Democrats. The chart above shows that, although Republican candidates are all-in for repealing Obamacare, health care is a bigger voting issue for Democrats. We need your enthusiasm and excitement this Monday, May 30th for the Adams County GOP entry at the big Commerce City Memorial Day Parade. This is a perfect place to involve the entire family in a GOP activity. It’s a great venue to showcase our GOP candidates and honor our nation’s military who have lost their lives in battle. It’s fun to watch a parade but much more exciting to be a part of it!!! The parade route is 1.5 miles long (it is the largest Memorial Day parade west of the Mississippi River). If you can’t walk in it, there are plenty of vehicles you can ride in or on. need people to carry our candidate’s banner signs. Bring/share pastries, donuts, breakfast burritos etc. There are port-a-pottys for bathroom breaks in the location where we’ll be staging and starting from. NEW THIS YEAR we are to park in the Commerce City Civic Center parking lot, 7887 E. 60th Parkway. Mike Stoffler (President of The Reagan Club) has graciously agreed to shuttle AdCo GOP parade goers from the Civic Center to our staging area. 7:45 a.m. – 9:45 a.m. Call Mike at (970)-222-7502 and he will pick you up in is 2012 silver Ford Explorer. The parade ends at King Soopers (4850 E. 62nd Ave, Commerce City, CO, 80022). We will get everyone back to the Civic Center, just ask for a ride or call Mike. Let us celebrate and thank the many veterans who will be along the parade route. We are excited to have you join Commerce City for the 52nd annual Memorial Day Parade on Monday, May 30, 2016. With nearly 100 entries, this year’s event promises to be another great event that honors veterans who served our nation. You are entry number 241 and will stage on Olive Street South of 64th Ave. A map is attached for your reference. It is strongly encouraged that you carpool to your staging location. Non-parade vehicles should not be parked on the staging streets, if at all possible. You may park on a non-staging side street or at the Commerce City Civic Center parking lot, 7887 E. 60th Pkwy. and carpool to the staging area. Horse entries are being asked to park trailers in the same location as last year and will be escorted to the horse staging area at 9 a.m. Water will be provided in both the parking and staging locations. After completing the parade, the preferred route back to the staging area is to proceed to the end of Parkway Drive, turn right into the far right lane of Hwy 85, which will immediately turn into State Highway 2. Proceed north in the far right hand lane of Highway 2 and turn right into the west gate of the Mile High Greyhound Park to holding/breakdown until the parade is over OR continue to work your way back to the staging area via 64th and the neighborhoods (see attached map). Here are some final instructions to ensure a great event. Please call Glenys Trost at 303-289-3728 or email gtrost@c3gov.com with additional questions. Have one person with your group check-in at the Blue Check-In Tent at the intersection of 64th Avenue and Olive as early as 7:30 a.m. and no later than 9 a.m. The staging coordinator will confirm your arrival. See you street captain for your entry number. The street captain will assist in ordering entries on your assigned street. Display the number on the banner of your entry for identification by the Master of Ceremony and judges located at the reviewing stand. All participants are required to theme their entries and decorate to meet the parade’s purpose, which is to honor veterans for their service to our country. The content and decoration of all units and participants must be appropriate for a family audience and in honor of our veterans. Parade entries must be no higher than 12’6” and no wider than 12’. No amplified advertising is allowed. Hand delivered advertising is acceptable. Due to the length of the parade, it is requested that car clubs travel the parade route side by side in two columns. Parade entrants shall not perform movements or drills that impede the movement of the parade for longer than one minute. Entrants must keep the parade moving and officers will inform entries if needed to advance. Nothing (including candy, water, gifts, etc.) may be thrown from any parade unit. If you wish to distribute candy, you may have people walking near the curbs to toss candy to the crowd. Parade entries are strongly encouraged to display a professional looking banner in front of their entry, proudly announcing the name and number of the entry for spectators and judges. We recommend the banner size be not less than 2’ tall x 6’ wide with clearly legible lettering recommended to be no less that 3” in height. Parade entries that advertise an individual (i.e. candidates for elections), organization, group or business are welcome in the parade. The advertising content of the entry; however, should not be most prominent element of the display or entry. Decorations appropriate for parade purpose must accompany all advertising related entries. Any animals that are a part of a parade entry must be well trained and can be safely controlled under parade conditions. Units with horses, dogs or other animals are asked to provide their own sanitation helpers to follow the unit and provide clean up along the route as well as in the staging area. Community judges will be awarding entries that represent the following “Best of” classifications: grand marshals’ choice, best of parade, most creative, most patriotic, and community spirit. Trophies are given for first place and ribbons are given for second through third place. Certificates are given to all participants in the seven parade registration/entry categories. Award winners will be posted on the city website, with trophy winners being invited to attend June 6, 2016 meeting of city council to receive their awards. Thank you again for joining us to honor veterans and those who paid the ultimate sacrifice. Saine HD-63 and Kevin Lundberg (SD-15) updating us on Amendment 69. AAron Ontiveroz, The Denver Post Ryan Frazier has collected enough valid signatures to qualify for the June 28 primary. Colorado’s Republican race for the U.S. Senate will be a five-man contest after all: on Wednesday, a district court judge ruled that candidate Ryan Frazier had collected enough valid signatures to qualify for the June 28 primary, according to a spokeswoman for Secretary of State Wayne Williams. The decision by District Court Judge Elizabeth Starrs is the latest turn in a weeks-long battle over which GOP candidates should appear on the ballot. Roughly a month ago, Williams declared that three candidates — Frazier, Jon Keyser and Robert Blaha — hadn’t gathered enough valid signatures to make it on the ballot by petition. THIS RONALD REAGAN JOKE ABSOLUTELY DESTROYS OBAMA DEMOCRATS!